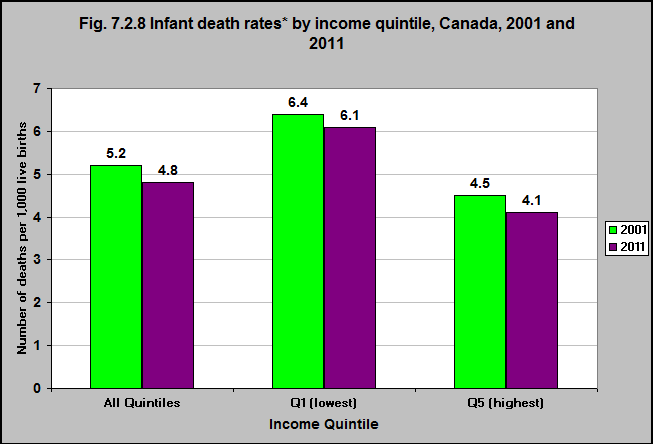 In 2011, the infant death rate for all infants in all income quintiles was 4.8 per 1,000 births – down from 5.2 in 2001. During the same period, the infant death rate decreased from 6.4 to 6.1 among infants in the lowest income quintile (Quintile 1) and from 4.5 to 4.1 among infants in the highest income quintile (Quintile 5). During 2001 and 2011, the rate of infant death in the lowest income quintile was approximately 1.5 times higher than the rate in the highest income quintile. During 2001 and 2011, there were approximately 2 more infant deaths per 1,000 live births in the lowest income quintile than in the highest income quintile.